The purpose of this program is to participate in planning, design and financial assistance in the construction of dams located on private property. Dams constructed under this program may involve one or more landowners. Public benefits to be achieved include flood control, sediment and erosion control, and water conservation. Other benefits include groundwater recharge, beneficial use of impounded water, and fish and wildlife enhancement. 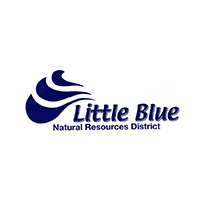 Any landowner in the Little Blue NRD is eligible to request funding assistance through this program. The minimum drainage area for a dam under this program is 80 acres. A minimum of 75% of the drainage area shall have adequate land treatment or protection as certified by the Natural Resources Conservation Service (NRCS). All projects for which NRD cost-share is requested must be designed by the NRCS (if eligible under their non-private competition policy) or a qualified and certified private engineer. Construction items for which cost share can be received include, but are not limited to: engineering, permits, earth fill, drains, concrete, tube and steel, grass seed and seeding, mulching, fencing, mitigation, construction inspection, minus any state or federal funds available. The NRD’s Cost – Share rate on all private dams is 80% of eligible costs. In each case, cost share will be based on the actual final quantities installed, multiplied by the lesser of the County’s Average Cost or the Actual Unit Cost submitted by the contractor. The purpose of this program is to participate in planning, design and financial assistance in the rebuilding of dams located on private property. Dams constructed under this program may involve one or more landowners. Public benefits to be achieved include: flood control, sediment and erosion control, and water conservation. Other benefits include groundwater recharge, beneficial use of impounded water, fish and wildlife enhancement. Before receiving payment, the cooperator must be willing to sign an agreement stating that for 25 years the project will not be removed, altered or modified so as to lessen its effectiveness without the consent of the district. A minimum of 75% of the drainage area shall have adequate land treatment and must be certified by the Natural Resources Conservation Service (NRCS). Construction items for which cost share can be received include, but not be limited to: Engineering, Earth Fill, Drains, Concrete, Tube and Steel, Grass Seed, Seeding, Mulching and Fencing, Inspection (during construction) and minus any federal funds available. All projects with an estimated cost of $15,000 or more must be bid by three contractors to establish the maximum cost-share. The cooperator reserves the right to select whichever bidder he wishes but will be required to make up the difference between the lowest bid and the bid selected, if the lowest bid is not selected. In each case cost share will be based on the actual final quantities installed, multiplied by the lower of the County’s Average Cost or the Actual Unit Cost submitted by the contractor. The Districts cost share percentage will be based on the chart found above.